Contains Milk. ALLERGEN STATEMENT: Manufactured in a facility and equipment that handles: Eggs, Wheat, Milk, Tree Nuts, Peanuts, Soybeans, Crustacean Shellfish and Fish. Contains: Dairy, Soy. This product contains naturally occurring caffeine. Allergen Statement - Manufactured in a facility and equipment that handles: Eggs, Wheat, Soy, Milk, Tree Nuts, Peanuts, Soybeans, Shellfish and Fish. Contains: Milk. This product contains naturally occurring caffeine. Contains: Milk, Peanuts. This product contains naturally occurring caffeine. 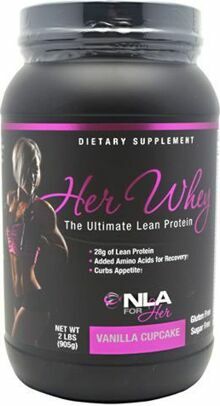 What type of Supplement is Her Whey and what are the benefits? How can Her Whey help you achieve your fitness goals? Her Whey can help you achieve your fitness goals by helping you get in enough protein every day, the right proteins at the right times, a small dose of very healthy, medium-chain triglycerides and glutamine for recovery. * Her Whey also bakes and mixes very well so you can make any treats to satisfy a sweet tooth while staying on track with your clean eating lifestyle.